Use the below interactive BMI calculator, also known as the body mass index calculator, to find out what weight status you fall into. Based on the results of the your weight status will either be underweight, normal, overweight or obese. BMI is measure of body fat based on your height and weight. This applies to both adult men and women. BMI does not differentiate between body fat and muscle mass. If you are a body builder or have a lot of muscle bulk you will have a higher BMI but would not be considered overweight or obese even if the calculator indicates this. BMI Calculator Results - What's it for? BMI is used as a screening tool to identify potential health risks related to weight concerns. The body mass index calculation uses a person's weight and height. It does not differentiate between genders, so men and women will use the same calculation. These classes are further broken down into categories. The four classes help indicate where you stand with your weight compared to your height. This is a good indication if there are potential health issues due to your weight. Depending on what category you are at within a class, this risk could go up. For instance, if your BMI is under 16, this would be in the severe underweight class. This could increase any health risks due to the low body weight. This is true for those in the obese class. 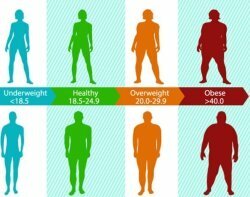 If they had a BMI of over 40, this puts them in the Obese III category, increasing health related issues. If you want to better understand the calculation behind this BMI Calculator, read the BMI Calculation article. In addition to this free online BMI Calculator, check out the BMR calculator as well. If you want to lose weight and body fat, then exercising will help. Use these tips to get motivated and start working out today. Use these tips to start eating healthier so you can lose the weight. Selecting healthier foods not only helps with weight loss, but can reduce the risk of certain medical conditions. If you are struggling to lose the weight, then perhaps a support group can help. Check out this article to learn more about the types of groups and select the one that works with your lifestyle.